Hi everyone! I’m James and I’ve joined the RGZ team as a Communication/Engagement intern. I’m a PhD Candidate at the Australian National Centre for the Public Awareness of Science (CPAS) which is part of the Australian National University (ANU). I’m also a Sessional Academic (read: Tutor and marker) for a couple undergraduate courses covering things from ‘the Public Awareness of Science’ to ‘Science, Risk and Ethics’. And to pay the bills I work for the ANU in an administration role at (essentially) the Business School as well as a few other odd jobs. But I am at heart an errant astronomer – having double majored in Astronomy/Astrophysics and Science Communications at the ANU for my B.Sci, graduating with Honours in 2015. I grew up in Alice Springs in the middle of Australia and had a purely spectacular night sky to look at. Something I only appreciated when I lived Brazil after graduating high school. As part of my undergraduate studies I did dabbled a bit in some astronomy research. Firstly I did a project with Dr Charley Lineweaver (if you don’t know Charley, you should!) looking at the (surprisingly fuzzy) distinctions we make between objects in space e.g. planet, dwarf-planet, asteroid, moon. Let’s just say the project didn’t go where I thought it would. Secondly, as part of an Astronomy Winter School I did research looking for ‘intergalactic stellar bridges’. Essentially chains of stars going from one galaxy to another which may have played a role in stellar formation in galaxies. I think. It was several years ago and the weather was against us when we went to do observations, so it didn’t go anywhere and my memory is pretty fuzzy on the details. Outside of academia, I was involved in the ANU Black Hole Society (the Astronomy Club), the ANU Physics Society and the Science Communication Society. Also I absolutely love the TV series Cosmos, both the Carl Sagan original which I saw as a teenager and then the Neil deGrasse Tyson remake from a few years ago. Since my astronomy research didn’t turn out particularly well, I ended up going down the science communication route. I’ve since done research looking into the effects of fictional doctors on young people’s perceptions of healthcare, factors affecting the uptake of vaccinations in Australia and the relationship between people’s perceptions of ‘Superfoods’ and their health behaviours. But I do miss the Astronomy and Astrophysics side of things so I’m super excited to be able to combine my two interests as part of the Radio Galaxy Zoo team. I’ll be hanging around in the forums under the name ‘JRAnsell’ and am keen to hear from you – if you’ve got questions about RGZ specifically or astronomy more broadly let me know! You can also hit me up on Twitter @radiogalaxyzoo or at radiogalaxyzoo@gmail.com. To stand on the shoulder of giants, we first have to find them. 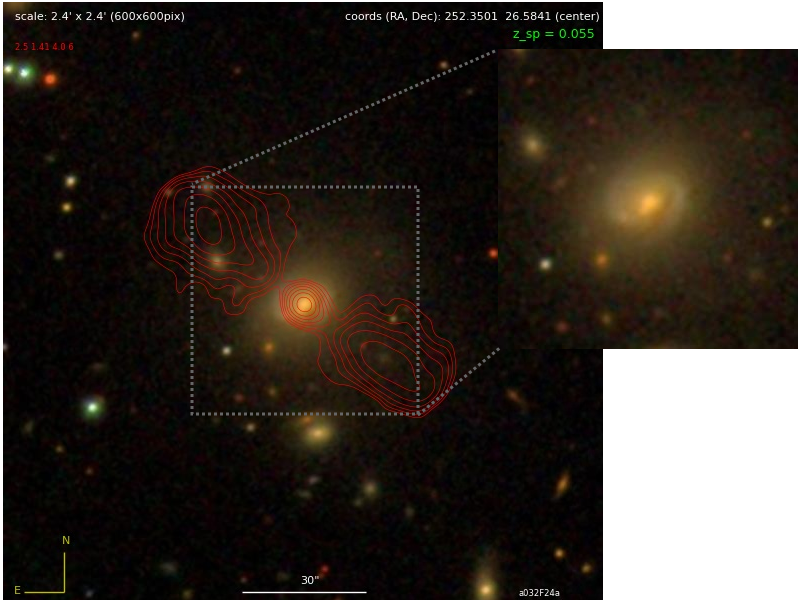 In Radio Galaxy Zoo, we are of course referring to the hunt for Giant Radio Galaxies. These Giants can provide us with valuable insights into the environment in which they reside as well as the evolution of radio AGN. In this post, I will present a summary of the highlights that Heinz A. has reported on RGZ’s search for Giants in 2016. It is clear that RGZ is leading the pack in collating and cataloguing these unusual radio galaxies. With our upcoming observing run using the Gemini-North 8-meter telescope in Hawaii, we will be following up several of these candidates. My warmest congratulations again to the Giants Team! Keep up the fantastic work. After all, we still have a third of RGZ to complete and I am sure more Giant candidates will be discovered in 2017. More information can be found at the Giant team’s RadioTalk Discussion thread. This end-of-year post is written by Jean Tate, an RGZ citizen scientist and associate science team member who is providing us with the 2016 update on her team’s hunt for more Spiral Double Radio-lobe AGNs — SDRAGNs. My warmest congratulations again to the SDRAGN Team! I will be sure to look out for more SDRAGN news in 2017. More information can be found at the SDRAGN team’s RadioTalk Discussion thread. A small band of intrepid scientists – citizen and regular – have been hunting SDRAGNs for quite some time now. These strange beasts were mythical, until 1998 when one was spotted above the Antipodes (it goes by the highly memorable name of 0313-192 … not). Since then a dozen or so other Spiral galaxies which host Double Radio lobes (and which have Active Galactic Nuclei; SDRAGN, get it?) have been bagged. With thousands of sharp-eyed citizen scientists, RGZ is an ideal place to look for more. The figure above shows J1649+26, an SDRAGN published by Minnie M. in 2015 (URL Link to her paper). The red contours represent the double radio lobes emanating from the supermassive black hole of this galaxy. You can see some of the SDRAGN candidates in RGZ Talk, by searching for the hashtag #SDRAGN (some will also have the hashtag #spiral; many candidates do not have either hashtag). If you find an SDRAGN candidate, please include the #SDRAGN hashtag in your comment. Happy 3rd birthday Radio Galaxy Zoo! In 2016, you have all contributed to more than 16 years of continuous classification and our project is now two-thirds of its way to completion and what a year it has been! The biggest science news coming out of Radio Galaxy Zoo this year will have to be the official publication of the Matorny-Terentev cluster of galaxies, (RGZ-CL J0823.2+0333) –named after two of our super-Zooites who discovered the Giant Wide-Angle Tail galaxy (shown in white contours to the left, Banfield et al 2016). We have also made great progress across several RadioTalk projects such as the Giants, the Spiral-DRAGNs, the Green DRAGNs and the HyMoRS. Therefore, we will be providing more detailed updates from the team leaders in the coming weeks so please stay tuned for more exciting Radio Galaxy Zoo science highlights from 2016. Our science team has also been evolving and this year, we bade farewell to Kyle W. and Chris S. who are pursuing new adventures and we sincerely thank them for all the fish. We also saw the arrival and departure of Tim F., our ANU outreach student who worked with Julie and we hope that you have enjoyed his blog posts earlier this year. This year, the RGZ science team welcomes Meg Schwamb from Gemini Observatory (who helped with the Chinese translation of RGZ) and Jean Tate, the first RGZ citizen scientist to become an associate member of the RGZ science team. Meg will be helping us with the upcoming RGZ follow-up observations using the Gemini telescope. We also have a new student joining our team and working with Julie in the coming year. Meet James L., a PhD Candidate in Science Communication at the Australian National Centre for the Public Awareness of Science. He completed his Bachelor of Science (Hons) in 2015 at the Australian National University with a double major in Astronomy/Astrophysics and Science Communication. I am sure that you’ll hear more from James himself in the coming year. Thank you all very much for your support again. We are most grateful for your help thus far. To finish the remaining third of the project, we seek your help in the coming days, months & year to complete this monumental task. We wish you all a wonderful holiday period and a great upcoming year! Meet two of our fantastic Zooniverse members who have been recognised as co-authors for a RGZ submitted paper. 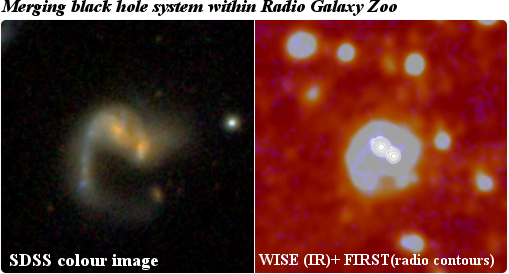 In March 2016, the Radio Galaxy Zoo (RGZ) team submitted a paper which is co-authored by two of our SuperRGZooites. Thanks to the help of citizens around the world, over 1.6 million classifications have been made. However, a very special thanks must go to two citizens who have been greatly involved in our most recent submitted paper. Meet Ivan Terentev and Tim Matorny, our Citizen Science co-authors. 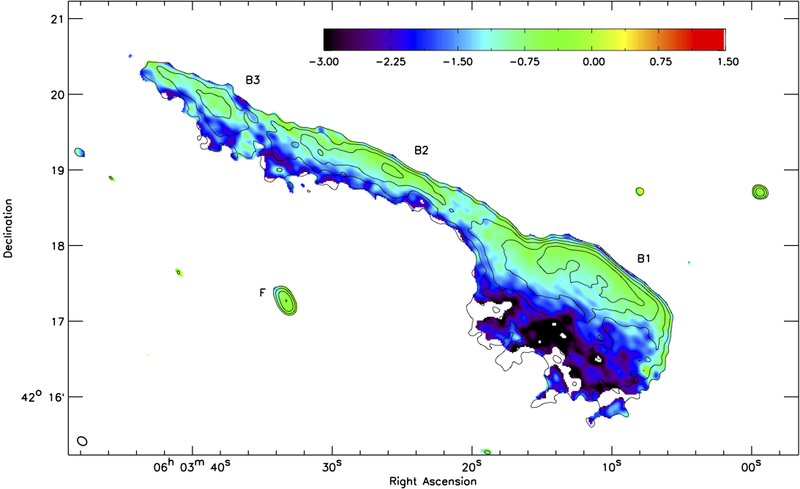 How did you discover Radio Galaxy Zoo and become involved? Tim: I had a passion for research and to be involved with generating new knowledge. So I began to look and met [the world of] citizen science and tried many different projects. I was already familiar with the Zooniverse, when I got email about new project – RGZ. Ivan: I became involved in RGZ from its beginning, more or less, in December 2013, and at that time I was part of the Zooniverse for two years. I was mostly contributing to the Planet Hunters project back then, but occasionally I switched to different projects just to look for what they have to offer. And it was during one of these “Let’s try something different” moments that I discovered RGZ through the announcement post in the Galaxy Zoo blog. What parts kept you interested and motivated to stay a part of this project? Tim: The team of scientists and their active participation is an important part. Their blog posts, comments and links have helped me to learn about the project and my involvement with the goals. Looking for host radio lobes which are separated by a 10′ [minutes] or looking at the behaviour of jets in galaxies clusters is really exciting for me. I like that RGZ covers a wide range of data: radio, optics, IR, X-ray. Ivan: If we are talking specifically about RGZ, it would be the RGZ Talk community and the fact that RGZ Science team is eager to communicate with simple volunteers and involve them in the research process. But a large portion of my motivation [for RGZ] is the same as for the rest of the Zooniverse projects. You see, I am sci-fi fan and it made me interested in space exploration. I like to watch documentaries about the astronomers, their work and all the amazing stuff in the universe around us and through the Zooniverse I can actually be involved in the process of science and help to shape the future, even if it just by a very tiny fraction. I never thought that something like this would be possible before I discovered Zooniverse. How do you feel about being a co-author of a scientific research paper? Tim: I am still amazed and feel more motivated to look for stunning new radio galaxies. Ivan: This isn’t the first time actually, I am also a co-author for three papers from the Planet Hunters, BUT it is always awesome, like every single time! Although, I keep my head cool over that since most of the work was done by the professional scientists. A huge thanks to them for the acknowledgment of my small contribution in the form of inviting me to be a co-author in their paper. With this RGZ paper, I got a chance to see the whole process of science starting from the simple question “What is that?” and then people trying to figure out what is going on, schedule observations, discussing things and I have been a part of it! All the way through the process, ending with the actual published science article. It was an amazing experience! Without the contributions made by our volunteers all over the world, we would not have been so successful in our endeavours. However, we have only reached 57% of our classification target. Head to www.bit.ly/RadioGalaxyZoo1 to become involved and you could be co-authoring another great discovery with us! Happy New Year! I hope everyone had a relaxing break. Radio Galaxy Zoo had a couple of highlights over the last year with new discoveries that will be out later this year. Well done everyone! We now have over 1.45 million classifications and are at 48% complete. the giant wide angle tail (WAT) discovery paper will be available soon. with all your work, RGZ has discovered over 100 new giant radio galaxies! we are working with the International Astronomical Union (IAU) to get the RGZ name official. All of this could not have been accomplished without all of you – big THANK YOU! Looking forward to a great 2016! Happy 2nd Birthday, Radio Galaxy Zoo! Happy 2nd birthday to Radio Galaxy Zoo! On Radio Galaxy Zoo’s 2nd birthday, we wish to thank you all for achieving more than 1.42 million classifications (~57.2 years of work)! That is an extra 20 years of classifications just in the last year. We are nearly at the halfway mark now so we are cheering you all on for the great effort and dedication that many of you have shown. So what has the science team done in the last year with your classifications? Our first refereed paper has been published. Anna Kapinska’s HyMoRS paper has been submitted for publication and we have another 3 papers on the sidelines in preparation and awaiting submission in the next few months. And we have also submitted several proposals to conduct follow-up observations of the many interesting systems that you all have found! Thank you all very much for your support again. We are most grateful for your help thus far. However, we still have more than half of our sample to classify. So we are seeking your help in the coming days, months & year to complete this monumental task. Final day of the conference. Still pro-pasta, but may have hit my personal limit on gelato and/or red wine. 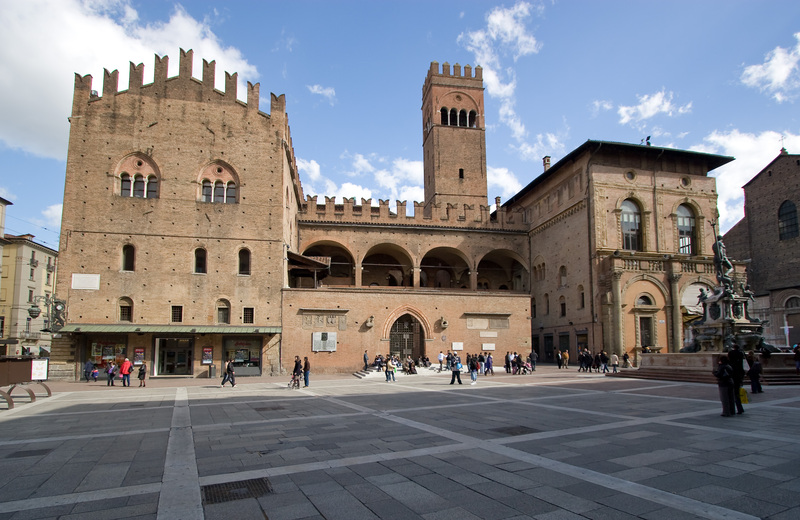 We had only a half day for the final day of the Bologna workshop on extragalactic radio surveys. After a tasty conference dinner at the historic Palazzo Re Enzo, we devoted the morning to AGN physics. This is the counterpart to the sessions we had on star formation in galaxies on Monday; almost all continuum radio emission that we detect in individual galaxies is either due to a thermal component from star formation or synchrotron and free-free emission that’s produced in some way by the central supermassive black hole, known as an active galactic nucleus (AGN). Leith Godfrey (ASTRON) gave a really neat talk on “remnant” radio galaxies, which refers to galaxies that still have active radio emission from the heated plasma in distant lobes, but for which we don’t see the jet because the black has shut down its active phase some time ago (in our observed frame). We can identify these remnants both via morphology (big radio lobes with no jet or core) and through their radio spectra – energy losses from the particles cause a characteristic curved shape which you see if you plot frequency vs. radio flux density. Leith has been doing statistical studies of remnants, finding that less than 1% of bright radio sources are in a dying phase. This is interesting since the number of sources we observe constrains the timescales on which radio galaxies die. It also points toward certain physical properties – there are strong adiabatic losses after the jet switches off, but the lobes seem to remain very high-pressured compared to their environments right up until the end of their lives. Marisa Brienza (ASTRON) gave the talk immediately following on a new remnant, named BLOB1, that she and her team just detected with LOFAR. LOFAR, a low-frequency array located in the Netherlands and other European countries, is just ramping up full operations, but will be a hugely powerful instrument for increasing the size of these samples over the next decade. Example of a new radio remnant, named BLOB1, detected with the LOFAR telescope at 137 MHz. From Brienza et al. (2015). After several more talks, Mike Garrett (ASTRON/Leiden) gave some closing remarks on the conference, including some summaries of what had been discussed and where he thought the future of extragalactic radio sources was going. I was really stoked that RGZ was one of the first results that he specifically cited as being important; Mike mentioned both citizen science and new distributed software routines as being crucial for dealing with the potentially billions of new celestial sources that telescopes will detect in the next decade. The role of citizen scientists in radio astronomy may change – I’ve talked to scientists at this conference about someday doing tasks other than morphology identification, for example – and we’ll definitely have to increase the interplay between the citizen science datasets and machine learning algorithms to maximize our survey results. But, as Mike said on his final slide, the present state of radio surveys is very bright indeed, and we have every reason to think that the best is yet to come. It’s been a fantastic workshop, and I’m grateful to the conference organizers for accepting my talk and offering financial assistance, the American Astronomical Society for covering my travel costs, and the NSF for partially supporting my work on RGZ at the University of Minnesota. Looking forward to a day or so of sightseeing this weekend, but I’m inspired to get back to work next week and continue being part of such a vibrant scientific community. 75% done with the conference. Still not sick of pasta yet. Day 3 of the Bologna workshop on extragalactic radio surveys started with a session on the most massive structures in the Universe: galaxy clusters. These collections of galaxies within massive dark matter haloes show up in radio surveys in several different ways: these include radio haloes, which are diffuse large-scale emission regions not associated with a particular galaxy; radio relics, which are similar features but found at the edge of clusters and likely driven by shock waves, and individual radio galaxies found within and nearby these clusters. Reinout van Weeren (Harvard/CfA) gave a really interesting talk on measuring the spectral index in radio relics; this means measurements of the ratio of the radio luminosity at different frequencies, similar to the way color is defined at optical wavelengths. Changes in the radio spectral index trace variations in turbulence in the intracluster medium, or possibly changes in magnetic fields; the fact that radio relics in many clusters have very different spectral index maps is a puzzle that makes it difficult to explain them with a single model. 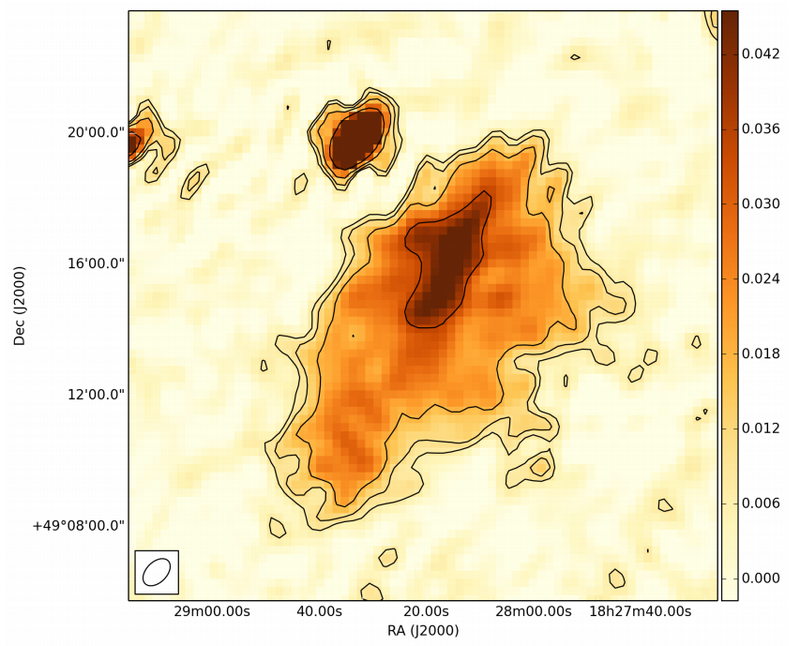 A spectral index map of the “Toothbrush Relic” (1RXS J0603.3+4214) between frequencies of 610–325 MHz, taken with the Giant Metrewave Radio Telescope in India. From van Weeren et al. (2012). We also had the second poster session of the conference, including another Radio Galaxy Zoo result! 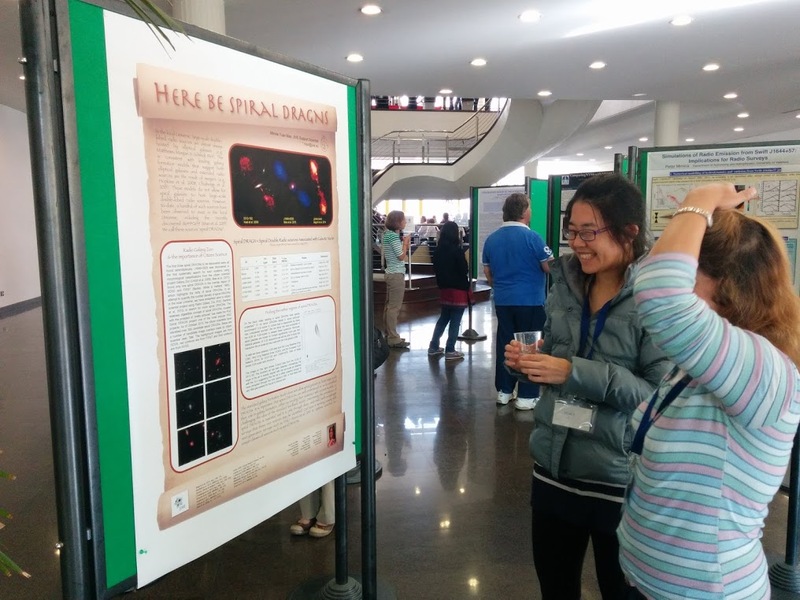 The poster was led by RGZ science team member Minnie Mao (Joint Institute for VLBI in Europe), titled “Here Be Spiral DRAGNs”. Jean Tate, Minnie Mao, and several RGZ volunteers and science team members have been using RGZ to search for radio-loud AGN whose host galaxy is a spiral. * The acronym “DRAGN” stands for “double-lobed radio source associated with galactic nuclei”. These are extremely rare objects – the number of confirmed spiral DRAGNs discovered so far can be counted on your fingers – but really interesting. The standard physical model for how double-lobed, powerful radio sources are generated are triggered by mergers between galaxies and ultimately their black holes. In the process, a major merger disrupts and destroys the disk of the galaxy, resulting in an elliptical – this theory would predict that we see double radio AGN exclusively in massive ellipticals. That’s mostly true, but the existence of exceptions are fascinating and force astronomers to consider alternatives or extensions to the merger driven hypothesis. Minnie and Jean are going through a sample preliminarily assembled in RGZ to try and identify more candidates like these. Minnie Mao (left) loves explaining her research on spiral DRAGNs from Radio Galaxy Zoo. *Changed wording on 24 October 2015 to emphasize the roles played by both volunteers and the science team.